Note: This post was originally posted on February 10, 2014 as part of the Transit 101 blog series. I am re-launching this series so that I can proceed with posting episodes that were never previously posted. Today, I’m launching my inaugural posting of my Transit 101 series. If you have not had a chance to read on my introductory post, please take a moment to do so. Thank you! In this first episode of Transit 101, I would like to go through the various ways that you can plan your public transit trip! Unlike the 1990s, where most people would have had to call their transit district or visit a customer service center, the advent of technology has made planning a transit trip so much easier! Many transit districts even allow you to purchase transit passes online, and some are now coming out with mobile apps to allow you to purchase transit passes on the go! I’ll go more in-depth into fares in a later episode. So without further delay, let’s take a look at the ways you can easily plan your transit trip. I’ll be going through each method in detail in a moment. My fictional character, Jeremy Riddle (above), loves to surf the web. When it comes to using public transit, the first place he goes to is Google Maps. Many transit districts have partnered with Google by providing their GTFS data, which allows customers to easily map out where they want to go, and how to get there via transit…all in one interface, and at no cost to the transit district! In fact, the following transit districts have already partnered with Google to provide this wonderful service to their customers! Although Google Maps has provided a transit option for a few years now, the entire interface has been redesigned with additional features to further help you with planning your transit trip in a snap! A couple of the newest features are the Schedule Explorer option, and the addition of real-time departure times for some transit districts. 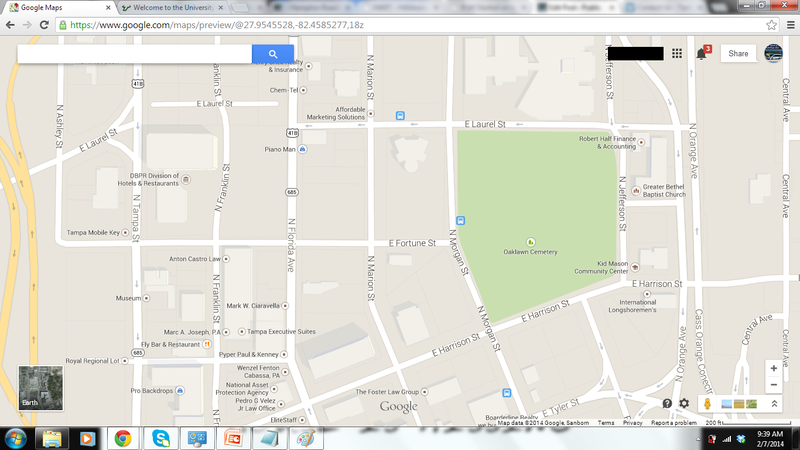 Let’s take a glance at Google Maps. Click on the images for a closer look. 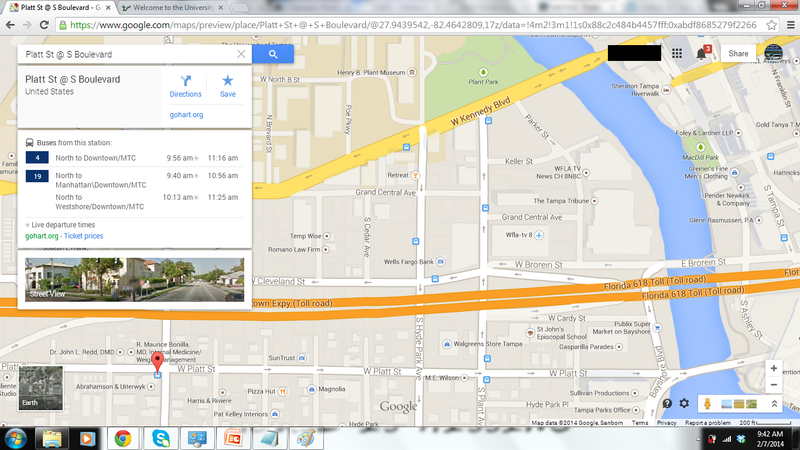 The Google Maps interface was recently updated with new features. Some features retained from the old version was good ol’ Pegman (lower right-hand box). There’s a couple ways you can plan your trip with transit. You can either type in an address in the search box on the upper-left hand corner of the map, or simply select a bus stop. Bus stops are indicated by the blue “bus” logo. In transit systems that have rail services, corresponding “train” buttons will show. Please keep in mind that you have to zoom in a bit for these buttons to show. Blue transit stop logos show up when the map is zoomed in. Clicking on a bus or rail stop will show you what services are available from that stop, where they terminate at, and in many cases, will show what times a particular bus or train departs from the selected location. Now, notice the small circles next to each departure time? Those circles indicate that real-time information is available for those particular trips. HART is one of several transit districts to allow real-time GTFS data to be transmitted to Google. A bus stop showing departure times for HART bus routes 4 and 19. At locations that show a bunch of routes, you’ll see the following. 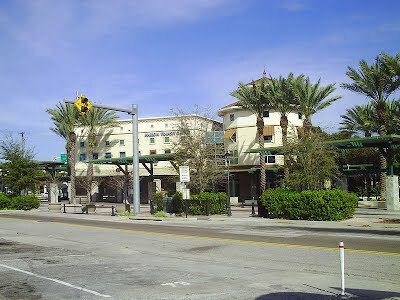 The Marion Transit Center and connecting bus routes. Note that MetroRapid North-South is given the route designation of 400. I believe at one time (before the recent update), you could click on the individual routes to see what times each bus departed. However, this functionality seems to have been temporarily disabled. Use the directional buttons to scroll through each step. To exit the preview, just click “Exit Preview”. Now, let’s do a quick “to” and “from” using the search box. 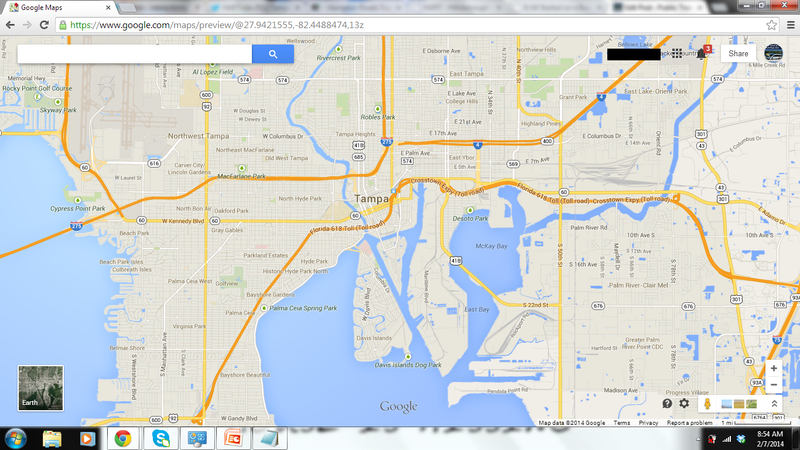 For this demonstration, I’ve chosen the USF Tampa Campus as my origin, and the Rivergate Tower at 400 N Ashley Dr in Downtown Tampa as my destination. Whether you type in an address into the search box, or just select a transit stop on the map, you’ll always have the option to fetch directions to or from the selected point on the map. It’s always pretty cool to have an interactive map! 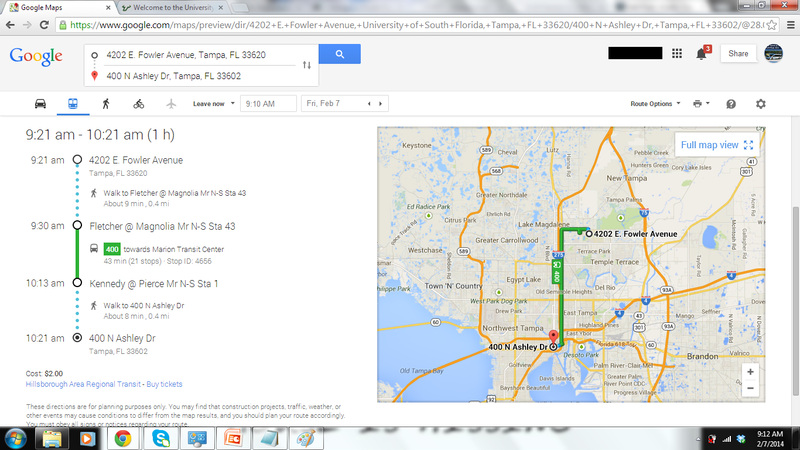 Now, by default, when fetching directions to or from a particular point on the map, driving directions will be selected. You’ll want to choose the transit option bu selecting the “bus” tab. Bike and walking options are also available for those who like to walk or bike from place to place. For longer-range travel, an airplane option is available (I haven’t tried that latter option yet). 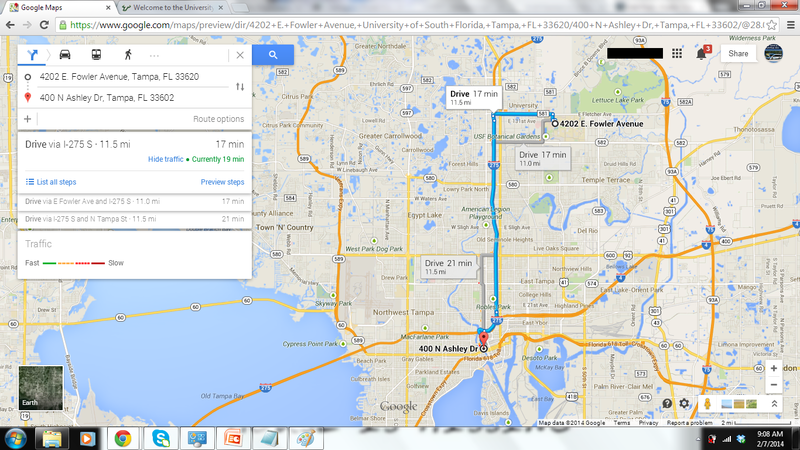 Any request to fetch directions on Google Maps automatically defaults to the driving directions option (car icon). Vola! 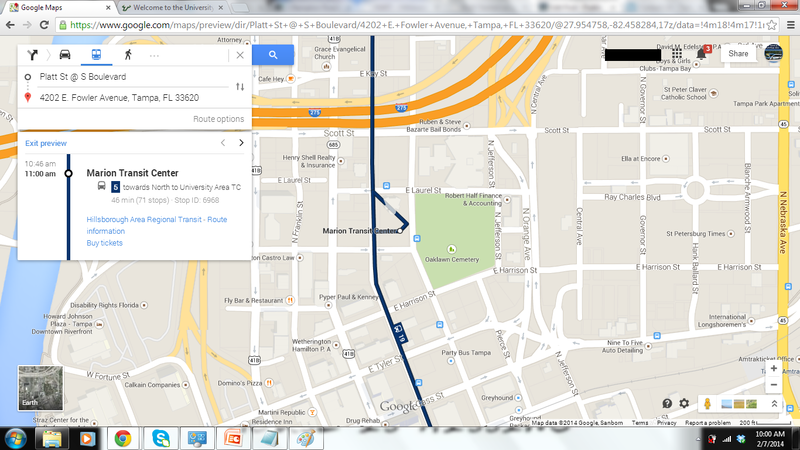 The transit directions option! 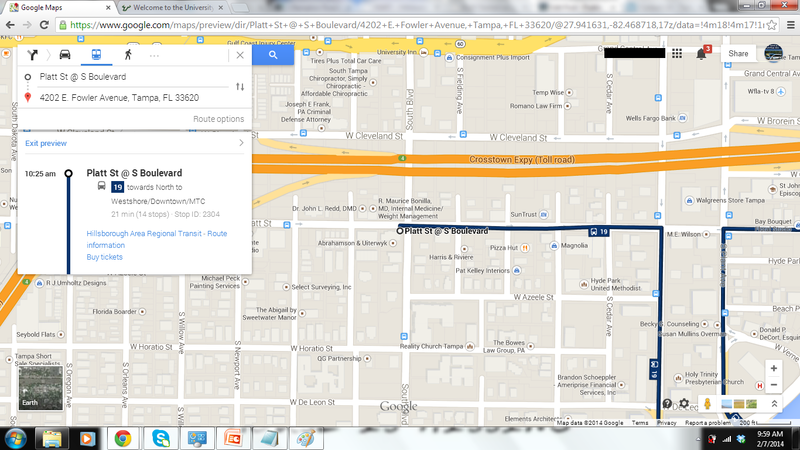 Using the transit directions option on Google Maps is pretty straightforward. Just like how Maps plots out the best route for you to take when you drive, Maps also plots out what is the best bus and/or rail route to take to your destination. Please keep in mind that several options may be available to you. Notice the link on the bottom of the left-hand box that reads “More Options and Times”? Click on it! It will take you to the Schedule Explorer option. The Schedule Explorer allows you to customize your transit trip! 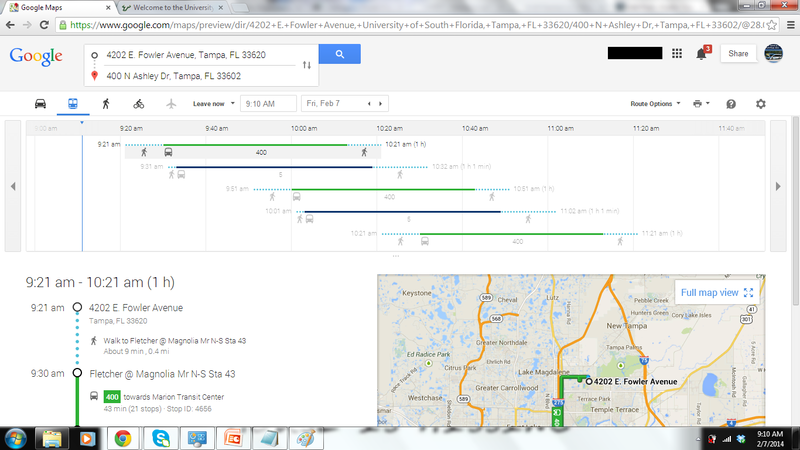 Something that I really like about the new Google Maps is the Schedule Explorer Option! This allows you to customize your transit trip by entering a departure time that is best for you, then selecting which routes would best suit your travels. The top pane shows what routes are available to you based on the departure time and date you selected. Below this pane is step-by-step directions on getting to your destination (walking to the bus or rail stop, the routes you selected, any applicable transfers, and reaching your destination), as well as a map. To return to the map view, select the “Full Map View” button on the right. A full view of what’s below the route option pane. In transit districts with rail services, additional options are available by clicking the “Route Options” button below the route options pane (just above the map). This pane allows you to further customize your trip by selecting options with the fewest transfers or least walking distance. And that’s not all! I could probably spend hours going through the different route possibilities for the HART system alone. 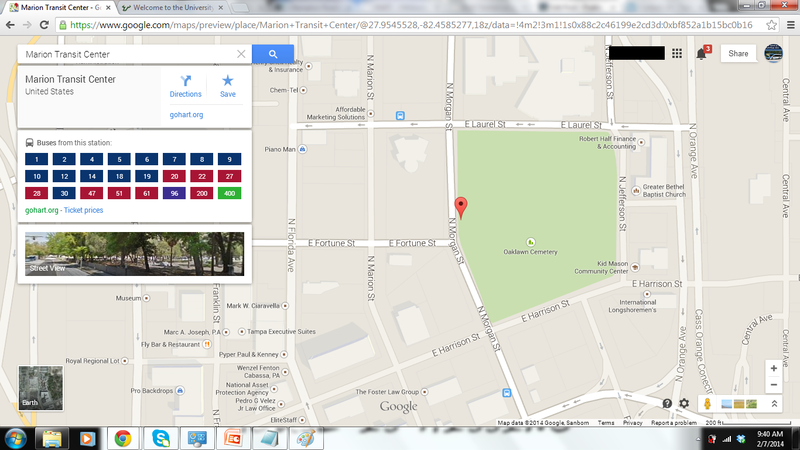 If you want to try things out for yourself, just head on over to Google Maps now! 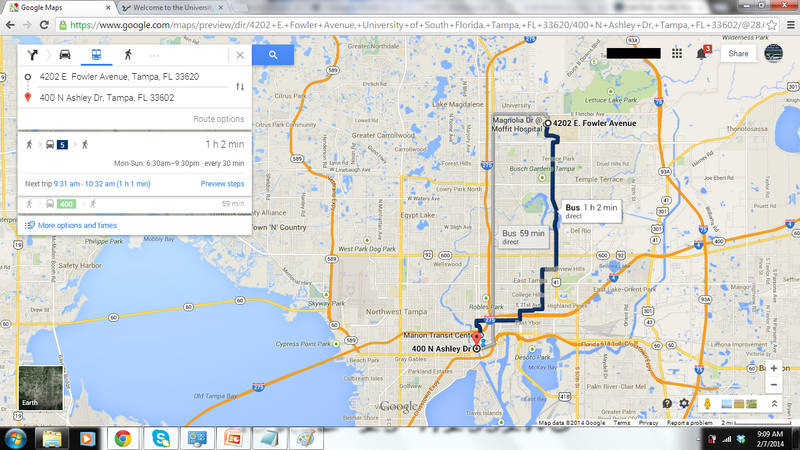 Google Trip Planner module on transit district websites. 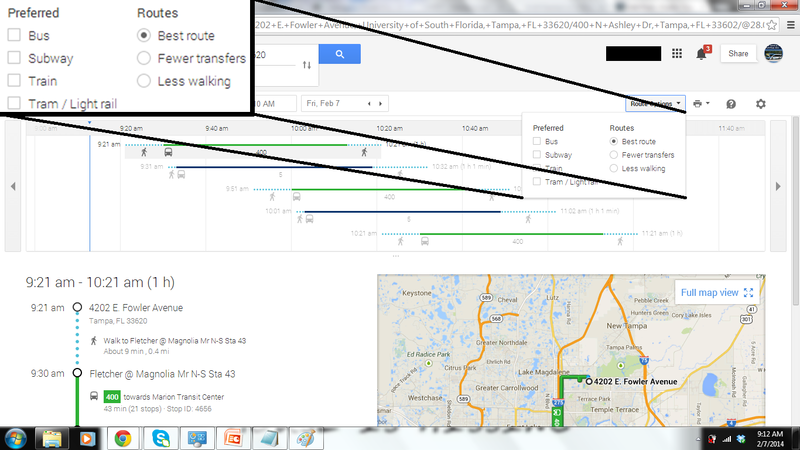 Some transit agencies have a Google Trip Planner module on their websites. This is the PSTA.net homepage. 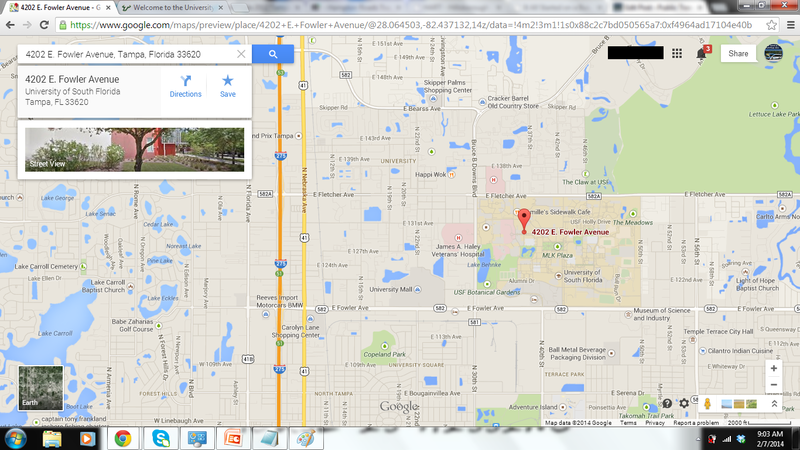 Some transit agencies , like PSTA, have a built-in Google Maps module on their websites. In these modules, you would enter an originating and destination address, then specify the date and time that you wish to depart/arrive. You will then be directed to the Google Maps website for the results. With the advent of Smartphones, comes numerous apps designed to help plan and navigate your transit trip. While I will go into detail regarding Smartphone Apps in a separate post, I thought that it was important to at least mention what apps exist. Please note that these apps are created and operated by third parties and not the transit agencies themselves. Although Google Maps is by far the fastest and easiest way to plan your transit trip, I understand that there are people that either don’t have access to a computer and/or the internet, as well as those who prefer to use the telephone rather than the internet. Don’t worry! Pretty much transit districts still have their telephone lines open, and they are still staffed by customer service representatives during the week. In addition, many transit districts are able to provide an automated interface (or IVR – Interactive Voice Response) through their InfoLine phone system to provide transit scheduling information 24/7! Below, I’ve listed the InfoLine phone numbers for each transit district that I’ve covered through blog posts and through my Transport sections. Please note that calls to the InfoLine after hours may be routed directly to the agency’s transit dispatch center. Staffed Monday through Friday from 6am to 8pm and Weekends from 8am to 5pm. Also staffed on most major holidays from 8am to 5pm. Staffed Monday through Friday from 6am to 8pm, Saturdays from 7am to 8pm, and Sundays from 8am to 4:30pm. Also staffed on most major holidays from 8am to 4:30pm. Hours of operation are not currently available. Staffed Monday through Friday from 5am to 7pm, Saturdays from 7am to 7pm, and Sundays from 9am to 5pm. Also staffed on most major holidays from 9am to 4pm. HART’s Marion Transit Center has a staffed Customer Service Window during selected hours Monday through Saturday, and some holidays. Some customers would rather speak to someone in person about planning their transit trip. That’s perfectly fine! Most transit districts still provide customer service centers by which customers can pick up schedules and speak with a customer service agent face-to-face. And while hours will vary depending on the district and day of the week, most customer service centers are typically staffed at least Monday through Saturday, with some districts being able to provide Sunday and Holiday hours. Please keep in mind that some districts close down their customer service operations on some holidays like Thanksgiving. Below, I’ve listed locations of customer service centers for Hillsborough Area Regional Transit, the Pinellas Suncoast Transit Authority, and Hampton Roads Transit. Please keep in mind that hours are subject to change, and up-to-date information can be accessed through the district’s website. Marion St and University Area Transit Centers. Staffed Monday through Friday from 6am to 5pm, and Saturdays from 7am to 5pm. Closed on Sundays. Staffed on most major holidays from 8am to 5pm. HART at City Hall is open from 11am to 1pm Monday through Friday. Closed on weekends and holidays. Williams Park Customer Service Center. Staffed Monday through Saturday from 8am to 4:30pm. Staffed Monday through Saturday from 7:15am to 5:15pm, and Sundays from 8am to 4pm. Staffed on most major holidays from 8am to 4pm. Hampton and Newport News Transit Centers. Staffed Monday through Friday from 6am to 5pm, and Saturdays from 9am to 1pm. Closed Sundays. Holiday operation may vary. Staffed Monday through Friday from 5am to 9pm. Closed weekends and holidays. Regardless of what method you choose to to plan your transit journey, please always keep in mind to have everything planned out prior to leaving for the bus or rail stop, and always arrive at the stop at least five to ten minutes prior to the scheduled arrival time. If inclement weather should arise, please arrive at your stop at least ten to fifteen minutes prior to the scheduled arrival time. If you happen to come across anything that is incorrect, please let me know as soon as possible and I will correct the information. I always strive to make sure everything is up to date.